Hahha did Joyce write that? Oh my! 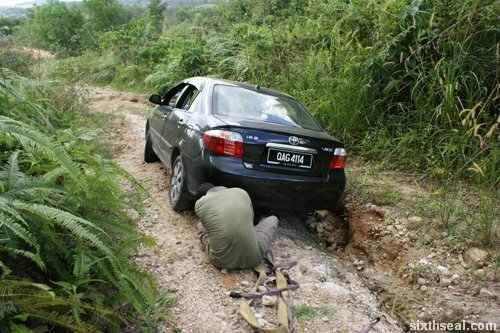 You should have seen how this comprehensively-insured Vios shook like a rag doll when it was towed out of that evil pothole! 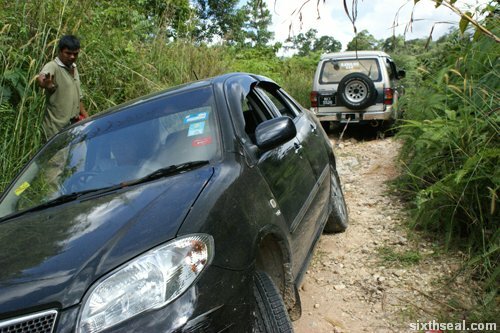 Dude, you should be driving a 4WD like every other Sibu fella. KY: Windy wrote that. :) Very FAIL. I was given the wrong directions and my mistake was pushing on despite the fact that the road was in no condition to be driven on. It was my decision to drive down the insane road. Haha! We had fun, that’s all that matters. Yeap, no prob. Just let me know when you need a ride. Cheers! LOL.. fail blog dot com? ive been an avid reader from the castitas days and i can honestly say, u really get into rough stuff with your car. looking forward for more interesting posts from you.long live sixthseal!! what happened to your gps device? 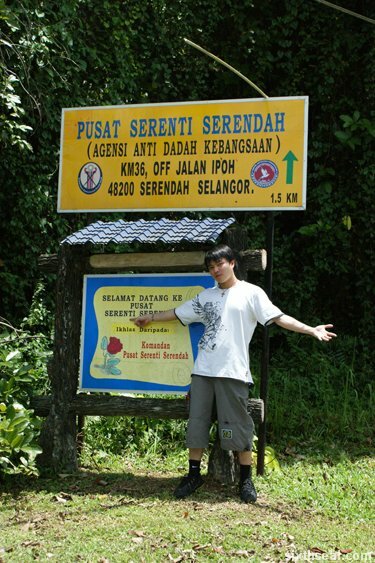 Sekeping Serendah is listed, you know…. Looking at your photos reminded me of my trip to Hawaii. Went with friends around the island Ohau. He wanted to see pineapple fields and took this path which we all thought was short cut. Ended up stuck in a ditch. Lucky we all came out of car and push it out ditch. Never again being stupid tourists. fish fish: Hey, that’s a really neat trick! Thanks for the tip, I shall keep that in mind. Hmm…I wish I tried that when we got stuck. You’re right, it would have worked with gravel too. Thank you for reading, I miss my castitas posts and I never did do any backups on that. imantulen: Unfortunately, there is no GPRS/EDGE connection there. I use Google Maps + GPS instead of a dedicated GPS program. I was concerned that we were stuck there WITHOUT a signal coz we haven’t been getting one since going up (there is no signal in Sekeping Serendah), but thankfully there were two bars on the signal strength indicator so I could call out. We would be fucked if there wasn’t a line…I don’t think it was 2 km, probably about 3-5km in. pm: Yes dude, it’s me. I’m still alive. I went off the radar to go to a rehab center for about a year, which was why I went MIA. I haven’t touched the stuff ever since, and you’re right, I feel much better and more importantly, SANER now. yeah its an experience, but eh, squatting like in the last pics doesn’t look a PHB. as well, just rambling. Champion! You thought your car is Land Cruiser ar? this is not 4×4 la..
All I can say is that the women who travelled with you can be counted on in any emergency. Haha. They at least had the brains to come with innovative ideas instead of piling the blame on everyone. Love to have them for travel companions anytime mate! Well at least you had good company in that difficult time, can laugh about it. Better than being stuck alone. Should have taken video of the event. Very kind of the tow guy not to accept payment. Darren: Haha! 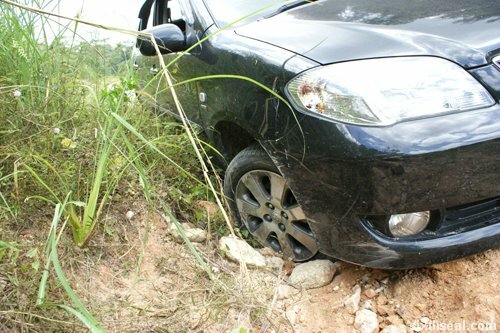 The road wasn’t that bad, it was the trucks going through that caused a lot of potholes and trenches to develop…which was how my car got stuck. 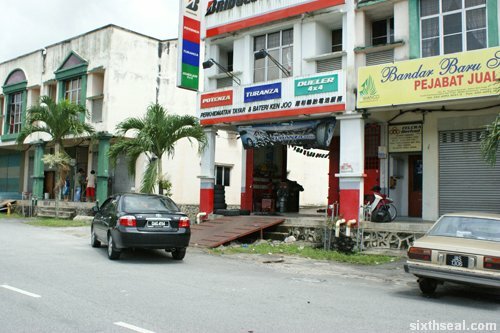 eiling: I thought that was the road into Serendah. -_-! Jeff: Yeah, having company beats being stuck alone. I only had my dSLR and that doesn’t take videos. I only remembered Windy has a digicam much later. I was sunburnt from the heat and couldn’t really think. We headed straight for the swimming pool as soon as we reached the resort. No chinese style squatting please! Omg,that pic of you doing the ‘chinese squat’ is really ugly.Thats very uncool!Don’t ever do that again. It goes with the Chinese characters, which means FAIL. Haha! seksan: No worries at all! …but yeah good signage would be awesome.